The completed solar installation on the roof of the Olympia Timberland Library. The Olympia branch of the Timberland Regional Library installed 33 solar panels were mounted on the building’s roof. The solar panels produce enough free energy from the sun to power the lighting in the library. The installation was part of a larger energy and water conservation effort by the City of Olympia, LOTT, Puget Sound Energy, Washington State Department of Enterprise Services and Ameresco. Soon the Olympia Library will have information about the system posted inside the building as well as a link to real-time energy production on their web page. The solar project came about because over 4,000 City of Olympia residents signed up for Puget Sound Energy’s Green Power program. In return, PSE gave the city a grant to install panels on the Olympia Library. 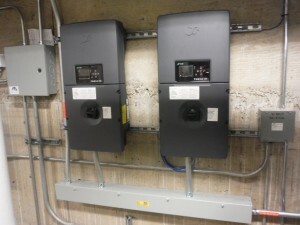 The system uses two made-in-Washington inverters. The project remained as local-loyal as possible. South Sound Solar, an Olympia company, was chosen by Ameresco to work on the solar design and installation of the panels. MC², Inc. an Olympia engineering firm did the engineering reports on the library roof. Both the panels and the inverters were made in Washington. Typically, solar projects on public sites have been done using private investors, through the community solar program. Private investors get the incentives and the public site — a school, office, building, or park — benefits from lower electricity bills. For the Olympia Library, the City of Olympia found a way to keep the incentives in the city’s economy, maximizing the benefits in a way that community solar never could. 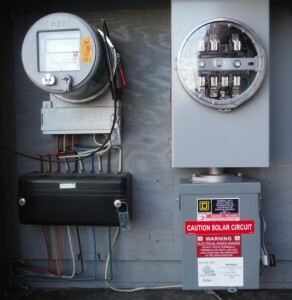 As a municipality building, the City of Olympia qualifies for the state solar incentives, processed through the production and net meters. The Library’s electric bills go down. Ameresco and South Sound Solar worked with the city and the library to find the best design and installation options. They went for a 8250 watt system mounted with weighted ballasts to minimize penetrations in the roof. “Our numbers show the library will save over $800 a year in electricity costs,” says Haffner, “and the city will receive $4000 a year in incentives from the state.” The system is also designed to be expanded in the future.